We are excited to have available the latest in steam weed control, it is a chemical free alternative to traditional weed management using herbicides. The method involves applying superheated saturated steam under high pressure to weed infestations and is an ideal alternative for weed control. This is useful for Government, Business and residential properties along footpaths, kerbs, certain landscaped and streetscaped areas as well as around schools and offices. 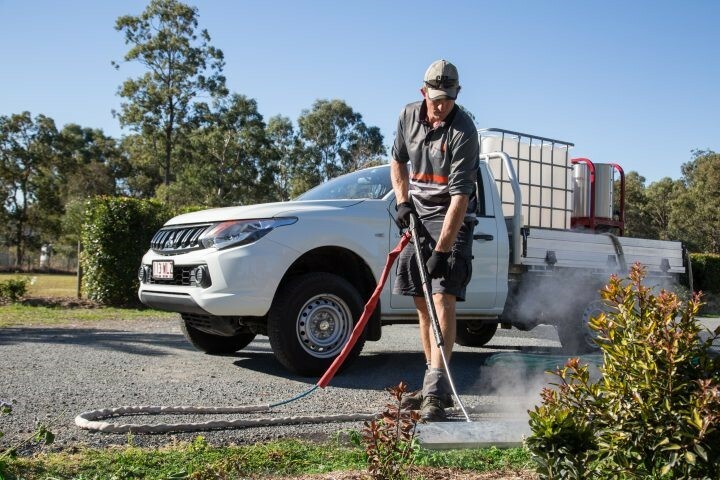 This method of weed control uses water only, it is safe for use in public areas, has no lasting effects on the environment and can be applied in all weather conditions. Domestic home lawns, Business verges, Public space, Vacant Blocks, Garden beds, Paving and Driveways. Every property is different. You may have problems with clover in your lawn. Maybe Broadleaf and Clover in your Paving. No matter what weed or grass problem you have, Midwest Pest Management can control your weed problem.